EPA 28 MPG Hwy/21 MPG City! Heated Leather Seats, Power Liftgate, 4x4, Satellite Radio, Premium Sound System, Turbo Charged Engine, 2.0L I4 ECOBOOST ENGINE, (4) ALL-WEATHER FLOOR MATS, CHARCOAL BLACK, PARTIAL LEATHER-TRIMM. PARTIAL LEATHER-TRIMMED SEAT TRIM, 2.0L I4 ECOBOOST ENGINE 3.07 final drive ratio. 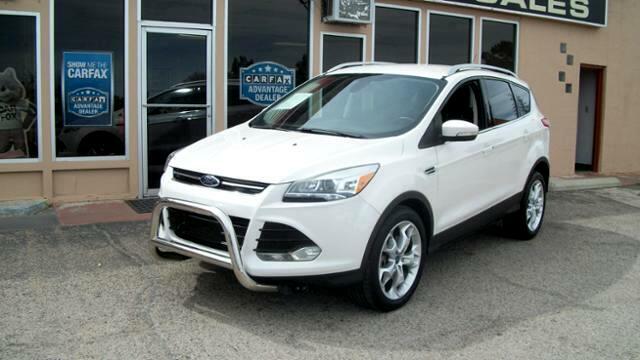 Edmunds.com explains The 2013 Ford Escape is a winner in the segment of small crossover utility vehicles thanks to athletic driving dynamics, an inviting cabin and plenty of useful high-tech features..